The national electricity supplier said on 20 April that the wind farm achieved full commercial operational capacity on 31 March, in line with the commitments by Eskom in terms of both time and cost. "Sere is Eskom's first large-scale renewable energy project and forms part of our commitment to renewable energy and reducing our carbon footprint," said the acting chief executive officer, Brian Molefe. "The Sere plant adds 100MW to the national power grid and [will contribute] to saving nearly six million tons of greenhouse gas emissions over its 20 years expected operating life, with average annual energy production of about 298 000 megawatt hours – enough to supply about 124 000 standard homes. "The unwavering commitment of the project team to drive the target dates set out and address issues timeously is something we can indeed be proud of as an organisation." 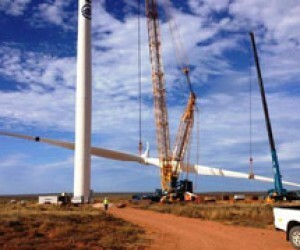 All 46 wind turbines had been erected and energised, the utility said, and the construction of the Skaapvlei substation and a 44km 132kV distribution line had been completed. The first wind turbine at the farm was erected in December 2013. The project took the first step towards the goal of synchronising wind turbines to the grid when the first string of seven turbines was energised on 6 October 2014. Although Sere had been completely energised and feeding power to the grid since 30 December 2014, the first quarter of 2015 was used to ensure that the milestone of commercial operation was achieved. 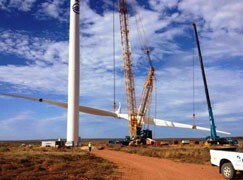 It is Eskom's first utility scale renewable energy project. Molefe said it was one of the largest wind energy projects in the country and was important in showing the utility's commitment to the growing role that renewable power would play in the future. Since the energising of the first wind turbine in October 2014, Sere has contributed over 90 gigawatt hours of energy to the national power grid. "Through this facility, Eskom has shown that it can construct a world-class wind energy facility comparable to any in the world with regard to cost, time, and quality and with a safety record in line with Eskom's zero harm policy. "There were also no environmental legal contraventions recorded on the project. Given the extent of the site and the amount of bush clearing done, this is an outstanding achievement," the parastatal said. The wind farm is not the only green energy initiative at Eskom, which is also developing a 100MW concentrating solar plant near Upington in the Northern Cape. Once fully operational, it will save about 450 000 tons of carbon dioxide emissions over its lifetime. The World Bank, African Development Bank, Clean Technology Fund and Agence Française de Dévelopement helped to fund the project.